Eagle Creek Travel Equipment. In 1999 we purchased a couple convertible travel packs, meaning you can wear them on your back or use the wheels and roll them behind you. For us, its critical to be able to either carry the pack, like when you are walking on the beach looking for a place to stay, or roll them, like when you are in airports and on paved roads. Because they open up like regular luggage, they are so much easier to live out of than a regular backpack. Eagle Creek also gets high praise for its durability and warranty which we have used in the past. We are also huge fans of their Pak-It cubes that keep our stuff contained. Thanks to Chris' mom and dad for handing these back down to us. Check 'em out at www.eaglecreek.com. 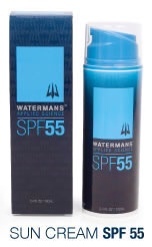 Watermans Sunscreen. We have basically been living outside for a year, and good sunscreen is key for us. While not cheap, Watermans Sun Cream and Face Stick SPF 55 proved it was worth the price. The sunblock ingredient is zinc oxide (so old skool) so it actually works, unlike most chemical blocks. It also stays on for hours while in the water and we needed surprisingly little of it because it lasted so long. Highly recommend it. Thank you Mike and Tracy Day for recommending Watermans and helping us get a bunch of it! Sea to Summit Silk/Cotton Sleeping Sheets. One of the best investments we made. Super comfy, light, quick to dry after washing and/or hot nights when the power goes out and there is no fan, which is so very common, especially in Sri Lanka. They also pack up into tiny little stuff sacks. Thanks to Matt Lewis for helping us out there! Patagonia A/C Yarn Dyed Shirts. Yeah they're expensive, but light, comfy and durable. What button-up shirt could you wear every day for 18 days while rafting down the Grand Canyon and then wear it for three years in an office cubicle, tucked in with a belt, then succumb it to Mexico dirt, then improve the design by removing the sleeves for the SE Asia leg of the tour? Chris' “Canyon Shirt” is like a baby blankie, full of holes, thin as rice paper, but completely lovable. What a man. Patagonia Swimwear. Ladies, looking for good suits that are cute (important) and actually stay on when you surf? Katy swears these are the only bikinis that stay put after going over the falls in Indo. Tested and approved. And after almost of year of surfing, they show virtually no signs of giving up. Which means she won't have to buy any more soon. Darn. Barnes and Noble Nook E-Reader. What a great time in which we live. Guidebooks, novels, and non-fiction classics all on one device, readable in full daylight and the battery lasts forever. Thanks to Katy's mom for the Nook. Thanks to an anonymous good friend who somehow supplied us with over a hundred free e-books. Side note: To date, Katy has read 37 books (not including travel guide books) in the last year!!!!!! iPad with 3G. In Mexico we had our MacBook but in Asia, we have a first generation iPad with us for entertainment, research, navigation, blogging, photo storage and editing, and storage of important numbers in case of emergencies. This also comes in handy when you are waiting for hours in a scuzzy bus station and want to entertain the locals with pictures of novelty things like snow or mountain biking. 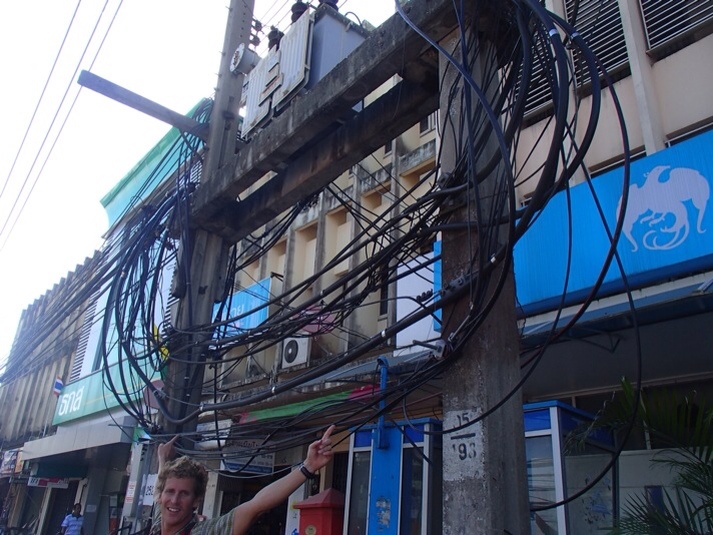 Unlike in the US, connecting to the Internet is SO cheap and easy. In every country we've visited, a local cellular SIM card could be purchased for between $1.50 and $5.00 USD. We could then add Internet usage for $5 to $10 USD, and recharge it as needed. This is one of those things that is so much easier in other countries than in the US. The iPad is both a lifesaver and the source of some majorly epic battles in sharing. Thermarest Compressible Travel Pillows. These pillows have been with us since 2003, when we bike toured the Great Divide, and they still work great! Yes, they are kind of bulky and take up space, but these are lifesavers. Do not set off on eight hour bus ride without one, or you'll be drooling on your Indonesian neighbor instead of your comfy pillow. Also, while Asian guesthouses and homestays seem to usually have good mattresses, they are lacking in good pillows. They're well worth both the price and the weight. Gold Bond Medicated Powder. Let's face it. It's the tropics. We are in the water a lot. It is hot. It is sticky. Rashguards don't always work. Things chafe. 'Nuff said. Yoga Mat. Yes, it's sounds bulky, heavy and frivolous and it is. But when we are surfing a lot, it is so nice to have for yoga and stretching. When we are not surfing, it's so nice to have for stretching and yoga for staying in surfing shape. We cut the mat down a bit to fit better in our luggage. It also works great as padding between the surfboards when transporting them in the boardbag. And most important……Addict Surfboards. Before embarking for Mexico, we needed new shortboards to travel with, so we did some research and found a shaper that we really liked in San Diego. Micah Shannahan of Addict Surfboards listened carefully to us, asked good questions, and understood what type of boards we needed, even if we didn't totally know what type of boards we needed. 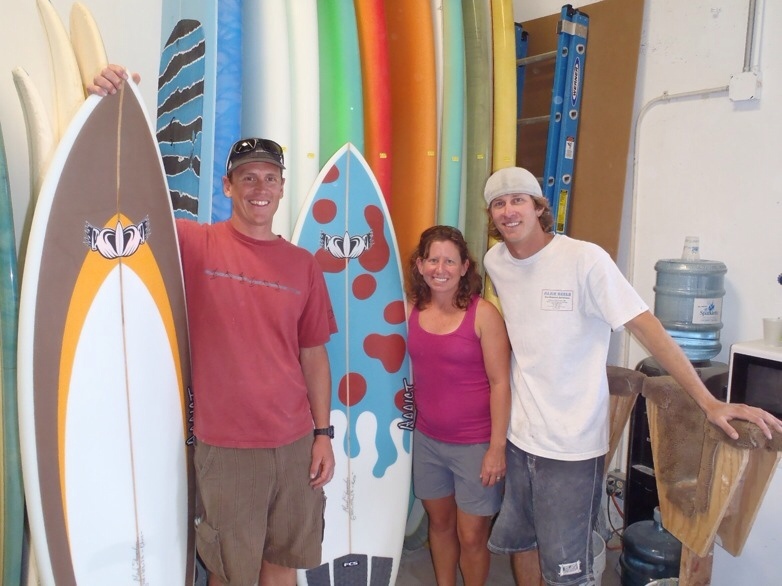 He set us up with two great all-around Epoxy shortboards to get us going. And, we got to spend a few hours with him at his shaping bay where he just gushed over how stoked he was to shape our boards and how excited he was for our adventure, which made us more stoked and excited. We couldn't do it without these babies! A few years ago, when we were planning this “year of surf travel”, the inevitable came up: Are we too old for this? We are going to be truthful here. We are not too old but….we are getting tired. While traveling through SE Asia (Malaysia, Thailand, Cambodia) allowed us to see amazing sights, it took its toll. Another 10 hour overnight bus ride? Check! A quick four days in Cambodia, hiking the Temples of Angkor in 90 degrees with 110% humidity? Got it! Or, a day that goes like this: Early morning TukTuk ride to a bus station. Three hour bus ride to the Cambodia/Thailand border. Standing in a maddening four and half hour queue to get through Thai immigration. Another four hour minibus ride to Bangkok, with a terrible driver hitting the brakes then gassing it every 30 seconds. We're not done yet. Another classic ten hour overnight bus to Chiang Mai, complete with a drunk Thai woman singing karaoke and trying to be my best friend. That's 25 hours of travel, straight up. And just to clarify, at 39 and 40, we ARE the oldest people, surrounded by chain smoking European youngsters who are heading home in time to get back to “Uni”. Yeah, like, I finished “Uni”, uh, 18 years ago people! Things really came to a head when I (Katy), after eight days of gastrointestinal woes, checked myself into a Bangkok hospital for treatment. After two days of wandering Chatuchak weekend market, which is touted as being the largest market in Southeast Asia, I hit bottom with a 100.5 fever. We suppose my street food habit indeed got the best of me, as I was diagnosed with an intestinal bacterial infection, and was pumped with intravenous antibiotics then sent home with a weeks worth of Cipro. Let the record show, however, that I persevered through fever, stomach cramps, nausea and the unthinkable all in the name of shopping to bring home cute clothes from Asia. Chris is quietly preparing his “Husband Of The Year” speech for his unwavering committment and support while I tried on shoes and jeans in my feverish state. We know we aren't getting any tears from anyone, and we aren't asking for sympathy, mind you. And, yes, we know, we tend to overdo it a bit. 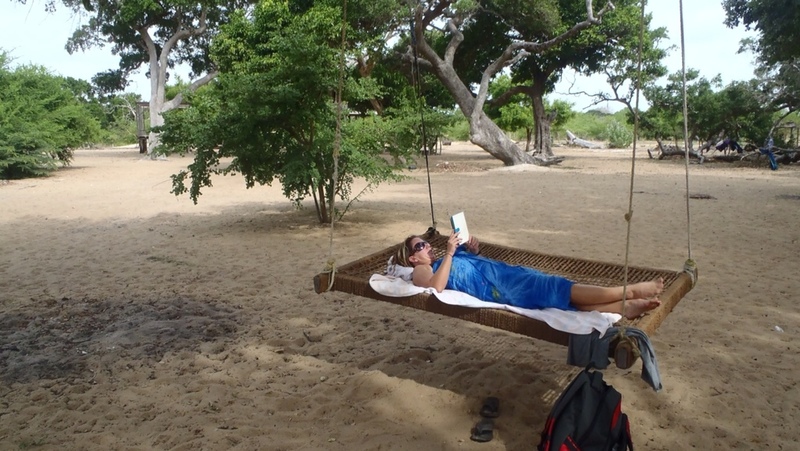 But we are also trying to be honest about ourselves and the reality of travel burnout. No matter what the other travel bloggers say, it happens. The energy expended in daily life in a foreign country is huge: the game of trying to figure out how to get anywhere you want to go, the ever present language barriers, having to figure out where and what to eat for every meal, the constant bargaining for goods and services, the feeling that you are generally at the mercy of others, the general lack of solitude/privacy, and just plain ole homesickness for the familiar. We combat these feelings several ways. First, we must get back to surfing. Having a “purpose” is good for us, and getting exercise and being in the water just makes us feel so much better. We now know we are surfers who travel, not travelers who surf. Second, we've tried to slow down. We moved quickly through Asia, never stopping somwhere for more than four days at a time, constantly sightseeing and keeping busy. Slowing down helps, even if that means staying holed up in an air conditioned room for a few days watching the Olympics on cable television and eating take out in bed. We did this by booking such a room (gotta love www.agoda.com) in Bangkok for a few nights before leaving Thailand. Third, while we try to slow down, we know that change is good too. A change in scenery, food, culture, activities helps keep us invigorated and excited. So, while we have just very slightly hit the wall, we are on the rebound. 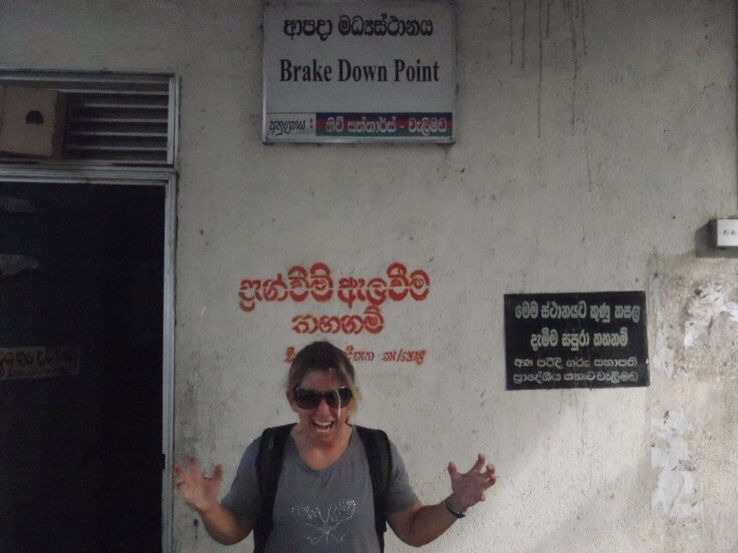 Being back in Sri Lanka is awesome, and we already have a train ride, many crowded bus rides, some temple visits, and a few days in Kandy under our belts. We just adore the bustling mini-city of Kandy with its tea stalls, saree shops and curry restaurants. We also had a great day touring some of the Ancient Cities area. 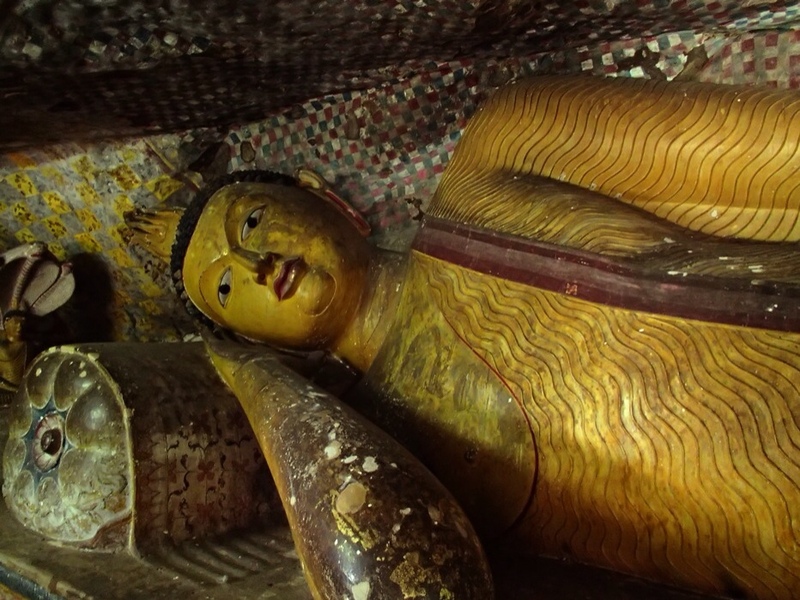 Even though we are pretty maxed out on temples, and we've seen literally hundreds of Buddhas, we managed to get to the Dambulla cave temples. 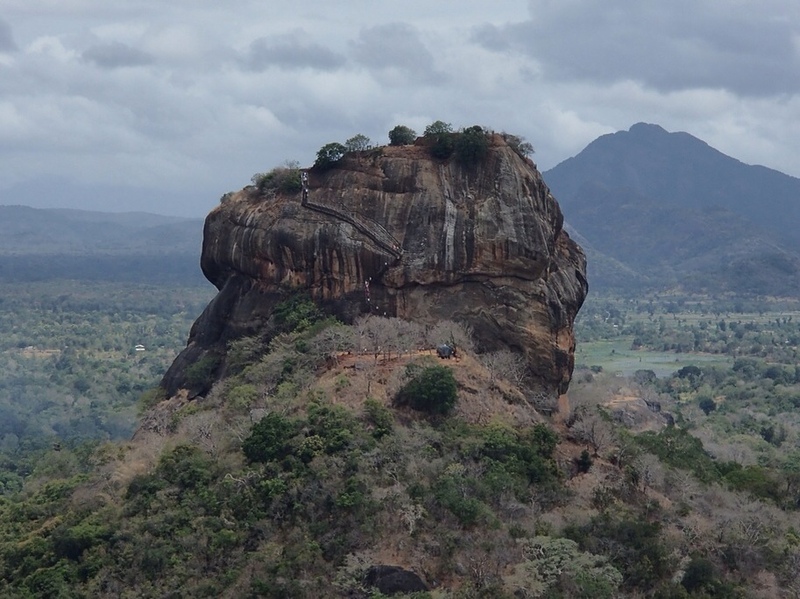 We also acted on gut instinct and skipped going to the expensive ancient temple on Sigiriya, but instead let our TukTuk driver take us to the next rock outcropping over. We hiked to the top by ourselves, and got an excellent 360 degree view including Sigiriya and the hordes of people. Oftentimes, foregoing the obvious attraction leads you to better stuff. We are now headed back to Arugam Bay, where we will stay put for at least three weeks, and pretty much do nothing but surf, eat, sleep, read and look for elephants. We'll be blogging as much as we can, so expect to hear from us again soon! Sri Lanka has some of the best fresh fruits and vegetables. 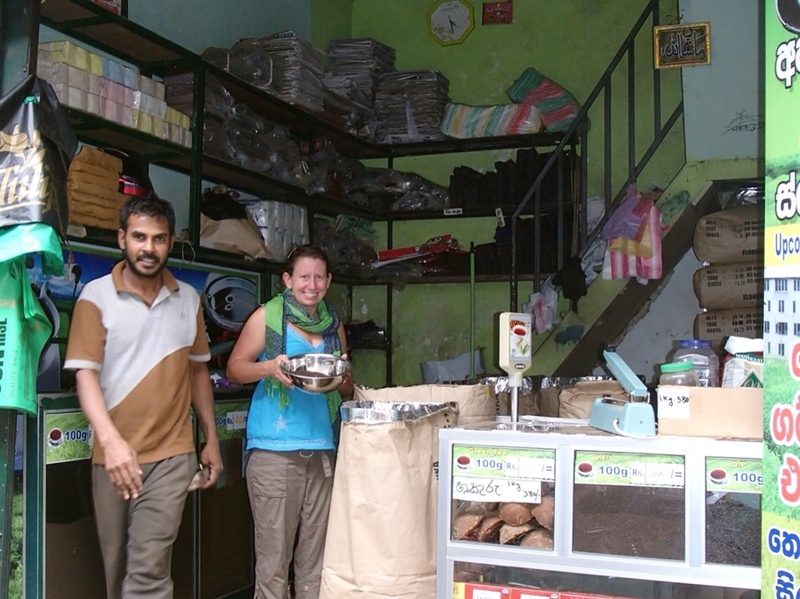 Buying bulk Ceylon tea in Kandy. Chris is trying some local booze, “lemon gin”. It smelled and tasted like Murphy's lemon scented furniture polish. We opted for a pint of rum instead as it just seemed to be a better idea. These guys are rad looking. We had lucky front row seats on this ride. There were easily 40 people crammed behind us in what was essentially a minibus. There he is again, The Buddha! 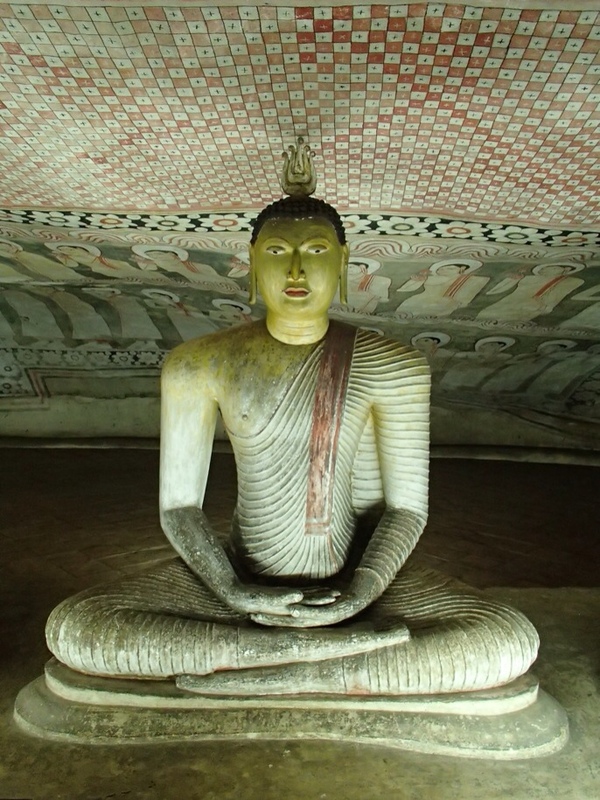 Dambulla cave temples. I've been perfecting my “reclining Buddha” pose, but I need to work on keeping my eyes open. View of Sigiriya from our rock. You can see the staircase with people. Exhibit A: After loading onto a very nice, air conditioned bus for an overnight trip across Malaysia, a Muslim cleric gets on the bus, says a very lengthy prayer (in Arabic, we presume), then walks down the aisle collecting money. Virtually everyone on the bus gives him money, except for us. He stops at our seats, looks at us for a while, says some more stuff, then continues on. Did he put a hex on us? Does he hate us because he knows we are American? Was he for real? We'll never know. 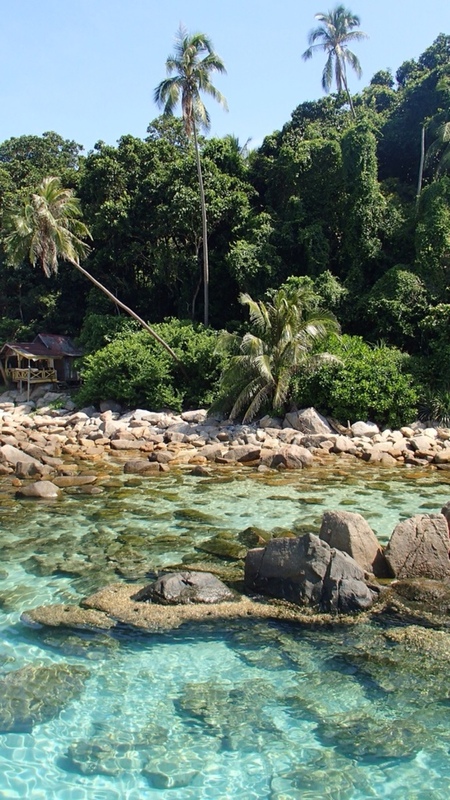 Exhibit B: We spent a few days at the Perhentian Islands, in the very northeast corner of Malaysia. 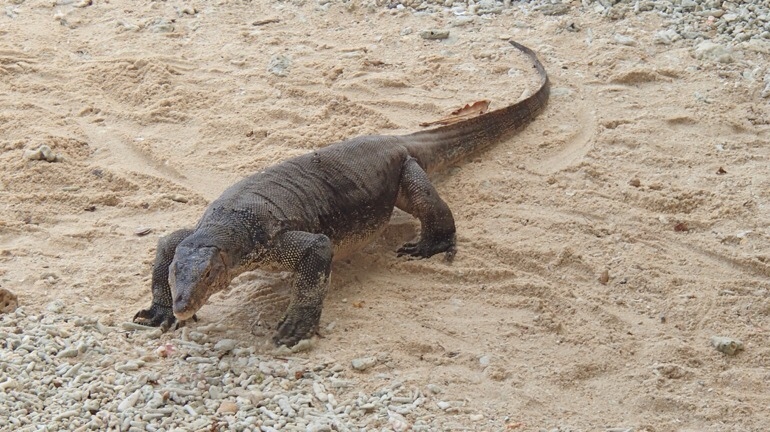 One fine day, while swimming and sitting on the beach reading, a very large (and I mean LARGE, well over two meters long) monitor lizard cruises down to the beach, walks around, then goes for a refreshing dip, swimming through the water. 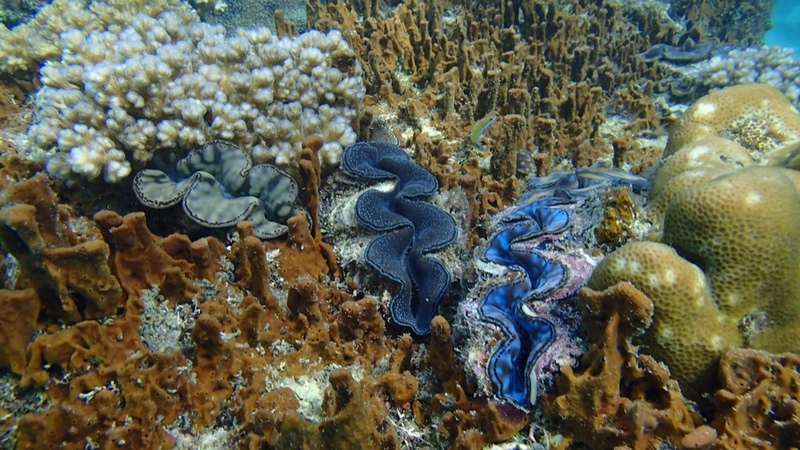 The thought of a large, swimming, carnivorous reptile is a little worrisome while snorkeling. 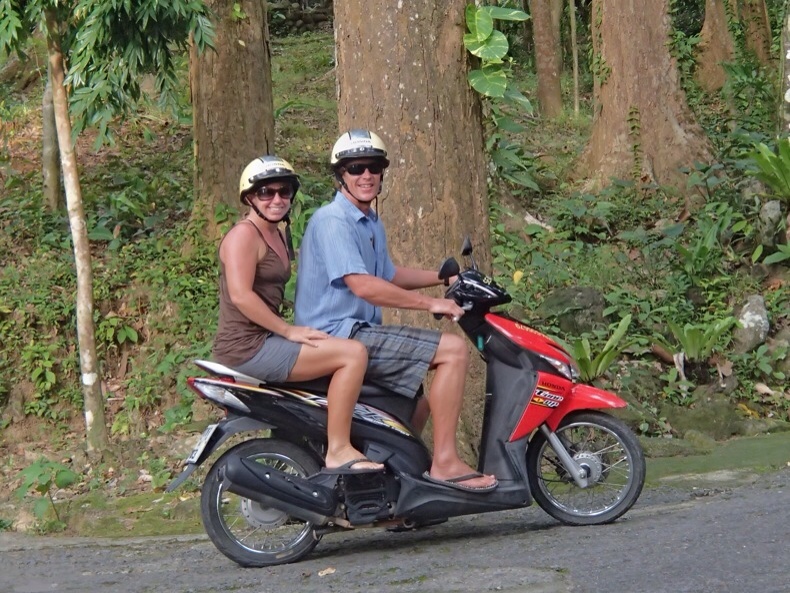 Exhibit C: Who knew we'd be surrounded by large, sunburnt Russians on the Andaman coast in Thailand? In places, everything is translated into Russian. The televisions in bars are tuned to Russian programming. They must have good airfare deals this time of year. 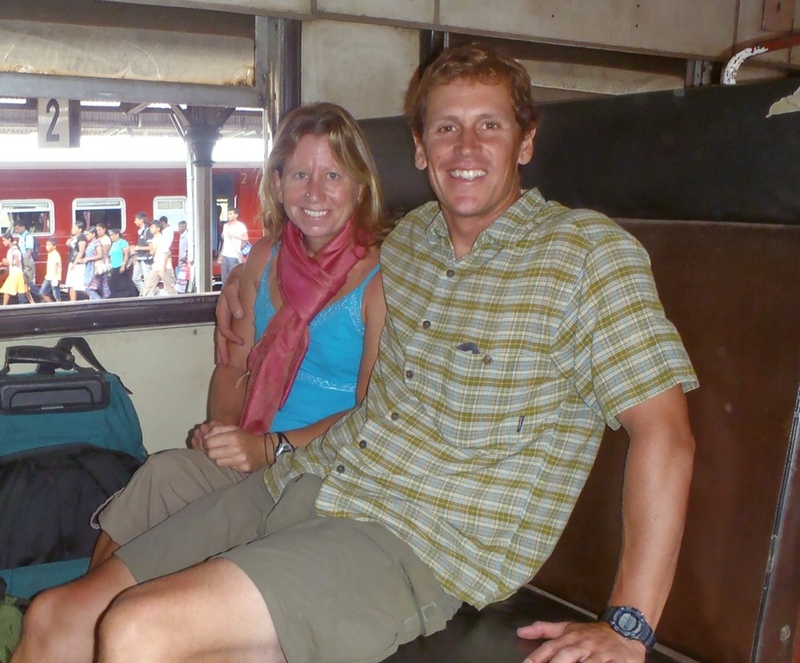 Our traveling style these days is at a much quicker pace, staying in one place for typically no more than three nights or so, so we have spent many hours on busses, trains, and boats. 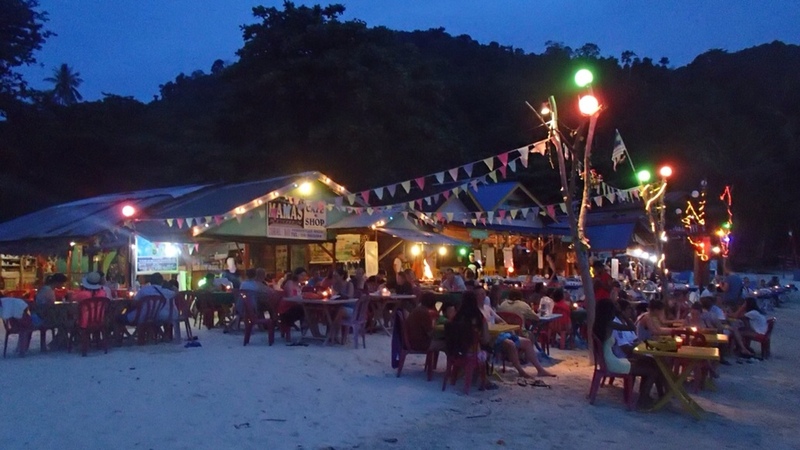 From KL, we went to Perhentian Kecil, a lovely, if not “backpacker” style island with insanely clear water and fabulous snorkeling complete with beachside bars, thumping beats, and abundant booze (rare for Malaysia). 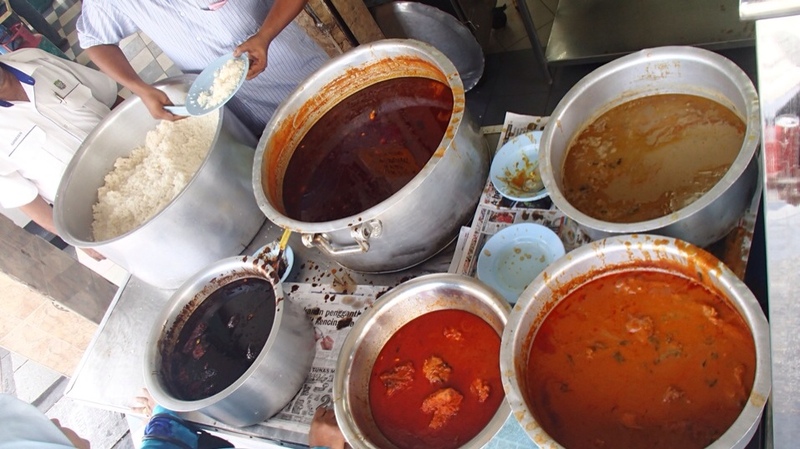 From there, we scooted back across the country, on another overnight bus, then ferry, to the northwest corner to Georgetown on Pulau Penang, known for its Chinatown, Little India, and abundance of street food. The goal was to be out of Malaysia before the start of Ramadan, the very important month of reflection and fasting for Muslims. During this time, Muslims only eat or drink one hour before sunrise, then again after sunset. Many eateries are closed during the day, which is quite dicey when you are (read: Chris is) hungry! However, although the majority of Malaysia is Muslim there is also a large Chinese population that turns out some exceptional food. Thank god for the Chinese! We left Malaysia on the second day of Ramadan, with full bellies. Our basic routine has changed from “eat, sleep, surf” to “eat, eat, eat” for we are in Thailand and the food is incredible, cheap and abundant. 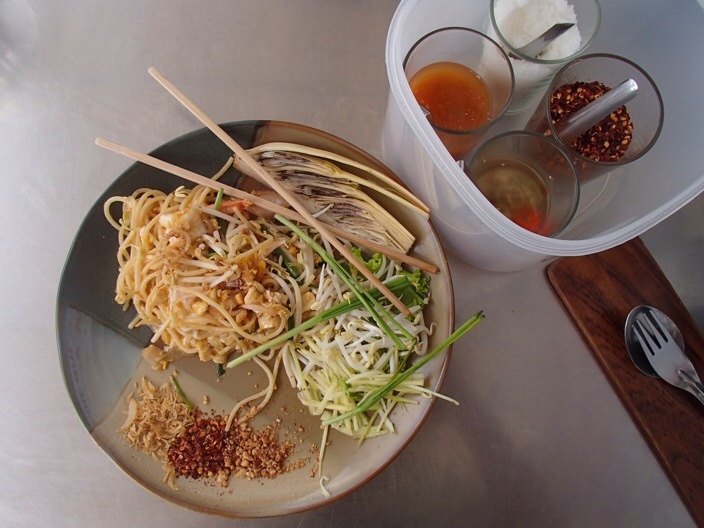 Piles of Pad Thai, satay, noodle soup, crispy pork, and of course panang curry. We literally eat two to three lunches a day, moving from one food cart to the next, spending two dollars at each place. Chris' vocabulary has been reduced to “I think I'm ready for another noodle bowl.” Although it is generally the low tourist season for most of Thailand, we find it to be quite developed and touristy, something we are trying to get used to. There are some advantages to this, particularly that transportation is very organized and it is easy to figure out how to get from point A to point B. The downside is that things are more expensive and the locals hassle you to take a taxi, eat at their restaurant, braid your hair into tiny painful cornrows (never in my life will I do this), or whatever it is that they are selling. 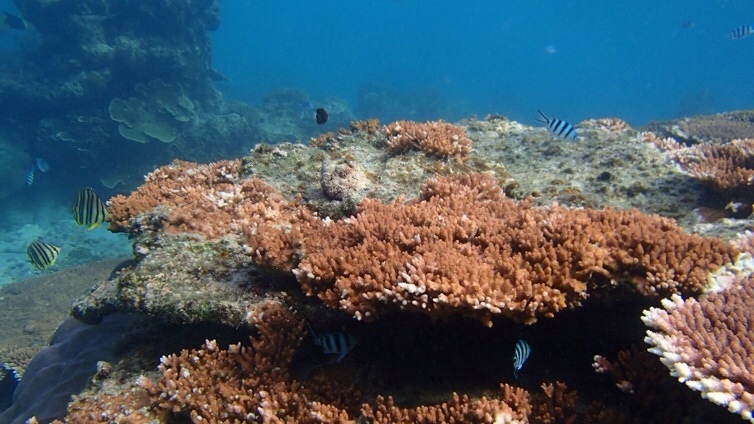 The seas on the Andaman coast are rough, but what that means for us… WAVES. We did our homework and made it to a “surf spot” in Thailand and lo and behold, got two much needed wonderful little surf sessions today. We rented boards (we left ours in Sri Lanka for a month) from a goofy British dude named Lee and spent the morning surfing with him in what we would now call marginal surf. Sometimes it doesn't take world class waves to make your day. 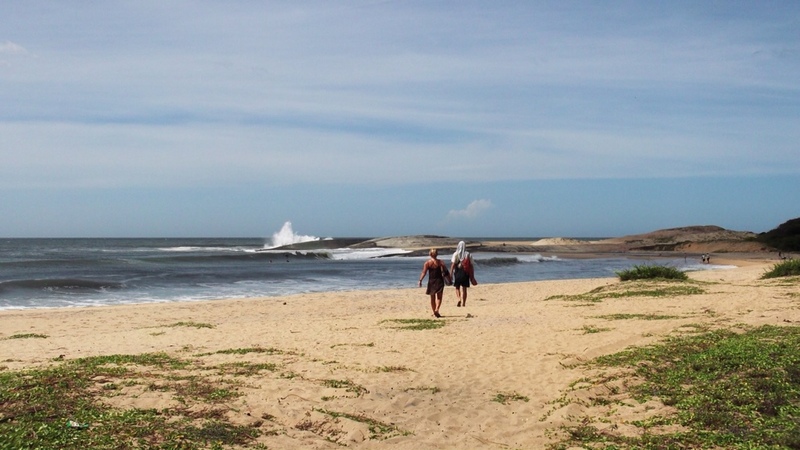 After not surfing for three weeks, we realize how much surfing has become a part of who we are. Withdrawal therapy may be necessary when we return to landlocked Central Oregon. Our new friend that we met in Malaysia. Yes, the water is really that clear. More fresh fish for dinner at this place. 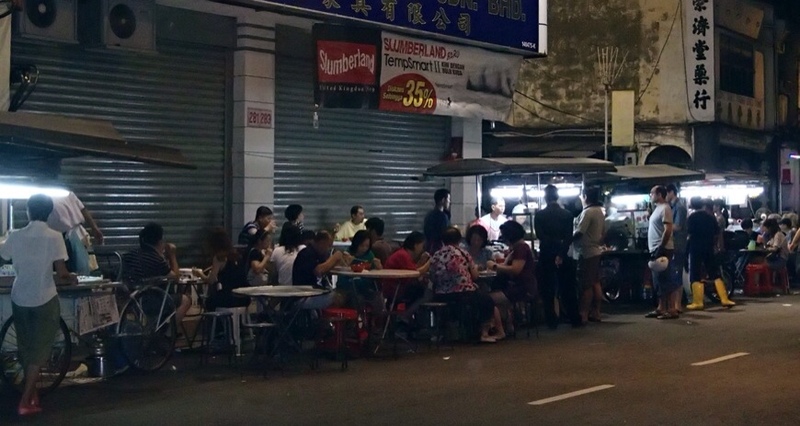 Infamous Georgetown hawker food. Nom, nom, nom! Need some heat? These will warm you up. We eat a lot of Thai food. Can you blame us? 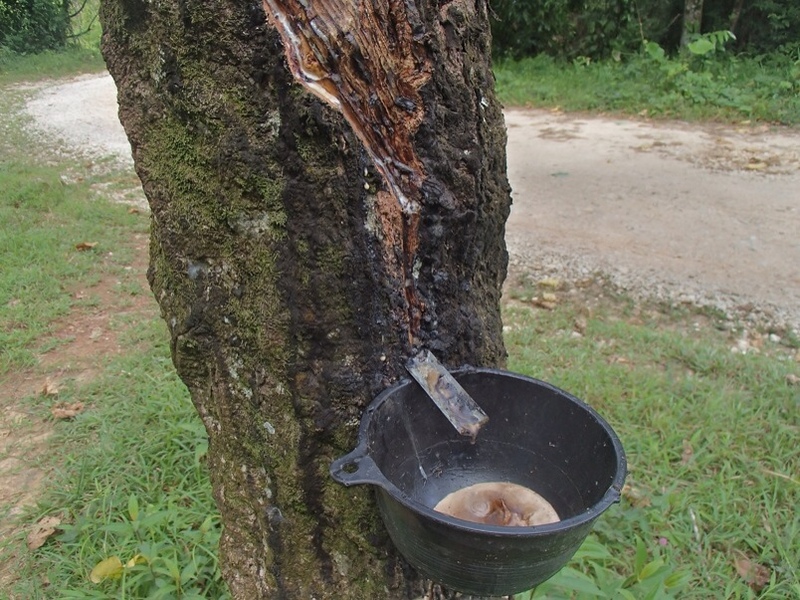 Much of Asias rainforests have been destroyed and replaced by palm oil and rubber plantations. We are happy to be on a motorbike again. Freedom! 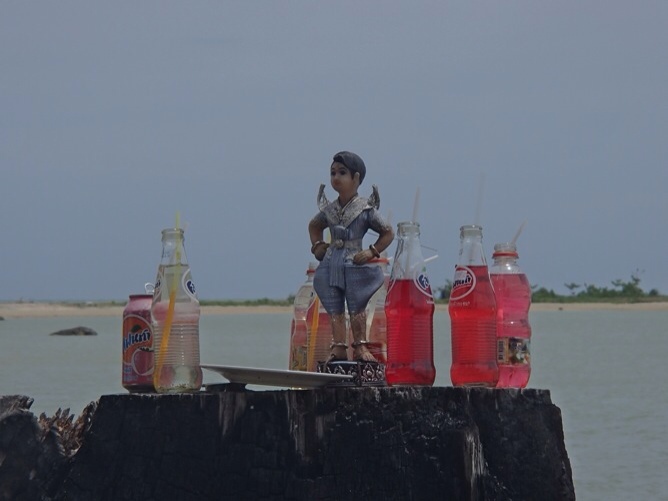 Offerings to the gods of Fanta. 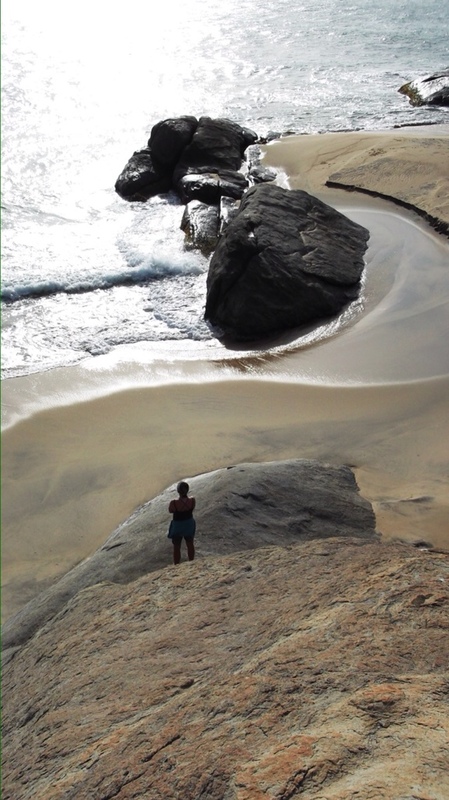 Sri Lanka is nothing short of fascinating and magical. 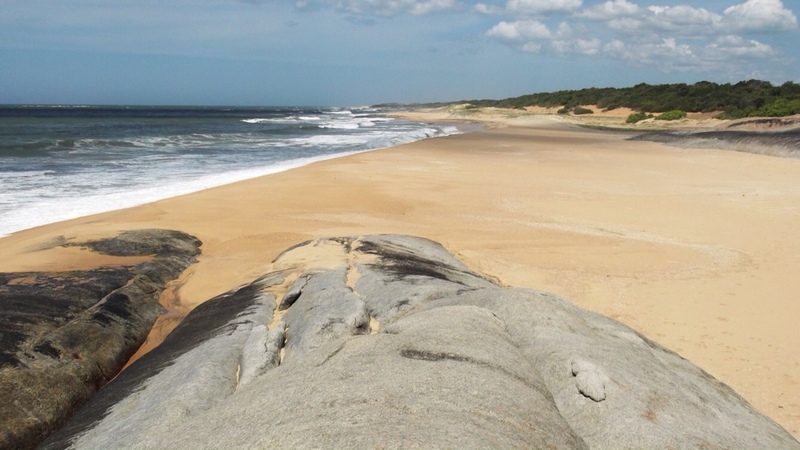 It is a land where following wild elephant footprints to the surf break is oh so common. Where in a single bus ride, we pass colorful circus-like Hindu temples, pristine white Buddhist dagobas, loudspeaker blaring mosques, and Catholic churches, all on the same highway. 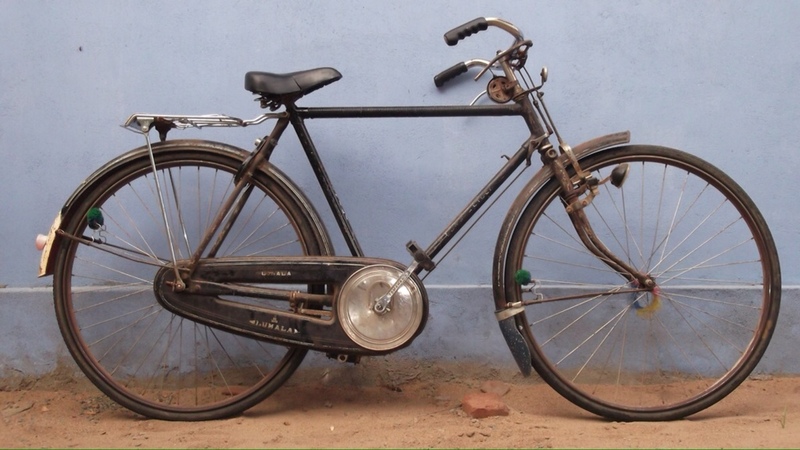 Men ride old, clunky bicycles, tucking their lungi (a sarong-like skirt) up underneath them. Pick up cricket matches occupy the beach and roadside clearings. Locals whisper “the monkeys are coming” and hurry to close up their kitchens so they don't get ravaged by the critters. We took a slow route through the center of the country, stopping in some of the higher altitude places amongst miles and miles of tea plantations. We came very, very close to going on a mountain bike ride, but nasty weather prevented us from pulling it off. Let's just say that Chris was frothing over the mountain bike potential. 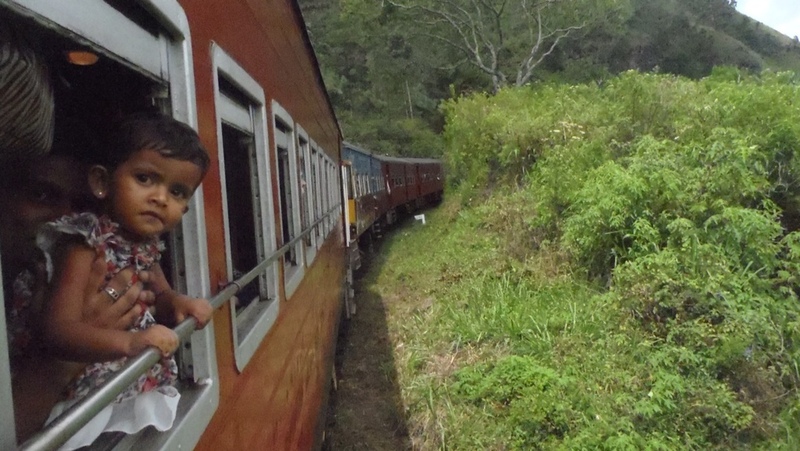 After spending a few more nights in the chilly hill country (yes, we were wearing long pants, and the worst part, shoes), we took more trains, busses and tuk-tuks to reach our surfing destination, at Arugam Bay, on the east coast of the island. 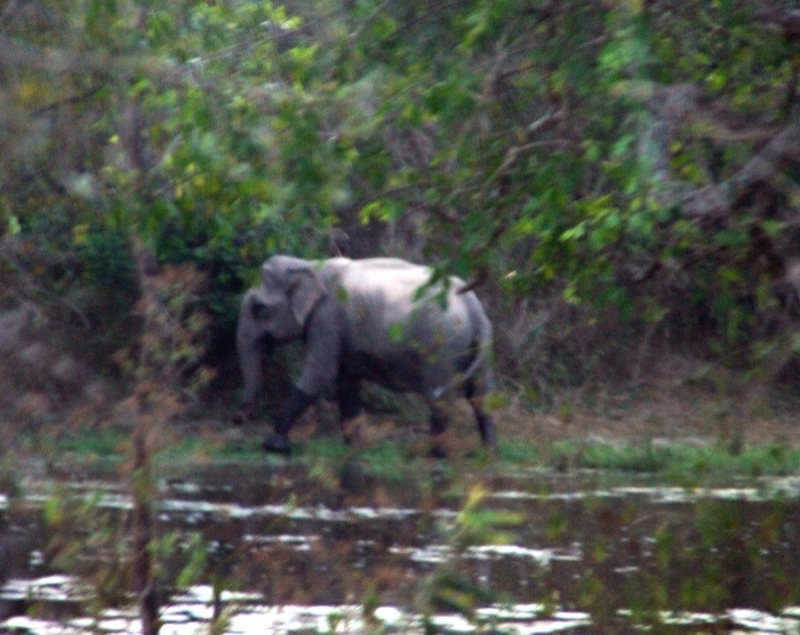 Our last leg of the bus provided great views of elephants roaming in the wild. Katy let out a little yelp, stared wide eyed out the window, the locals stared at her, and everyone was happy. It's easy livin' in Arugam Bay. A Sri Lankan surfers haven, it is packed with good eateries, cheap accommodation, a tuk tuk waiting on every corner – and lots of surfers. Lots and lots. It's the most crowded place we've ever surfed (that includes places in California, like Trestles and Huntington Beach), so, for better or worse, we are honing in our people skills! We're surrounded by Europeans, Australians, Kiwis, and Israelis on holiday. I digress… To date, in almost three months of travel in Asia, we have met five…only five…Americans amongst hundreds of South Africans, Australians, Kiwis, Israelis, Austrians, Swiss, Germans, Irish, Spanish, Portuguese, Czech, British, Japanese, Canadians, even a guy from Reunion Island. Do you know where Reunion Island is? I didn't, until now, so load Google Maps and look it up. We routinely have people asking why it is that Americans don't travel, and we spit out some weird answer while we look at our feet and mumble “it's a lot of things – fear, money, the fact that travel is not a strongly supported value in the US, and well, we just don't have a good answer.” All we can say is do yourself a favor and buy a plane ticket to somewhere, anywhere and see the world. 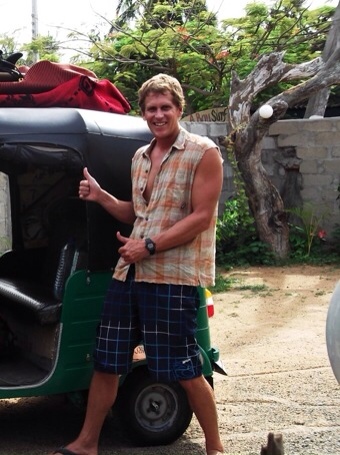 Back to Arugam Bay, and our two favorite pastimes, surfing and tuk tuk driving. The surfing here, albeit crowded, is a downright kick in the pants. The east coast is teeming with a bunch of known and not so well known right hand, sandy bottom point breaks. Cruiser rides, low fear factor, warm blue water, and absolutely incredible pristine beaches make for very good times. The air so hot, the clouds so low …oh wait, those are song lyrics. But it is hot and dry here during the day, but the evenings are perfect with a light breeze. Our second most enjoyable hobby is exploring the area in our own dirt cheap personal tuk-tuk that we are sharing with our new friend, Kiwi Tom. This is good for two reasons: 1) we can go wherever we want, whenever we want. 2) we get to drive a tuk-tuk, which is a completely functional yet hilarious vehicle. Three tiny wheels, handlebar steering, manual drive, complete with customizable horn sounds, fringe and stuffed animal accoutrements. Yep, its pretty fun. It does pavement, dirt, even a little sand. Unlike at home where we have “singletrack” or “doubletrack”, here we have “tripletrack”. We are working on the sound system, and perhaps installing a black light, to better pimp our ride, yo. We are very close to the border of one of the many national parks in Sri Lanka, Yala East National Park, so the area is rich with animals and birds. We took a half day jeep safari one afternoon and saw incredible amounts of wildlife, including elephants, wild boar, wild buffalo, jackals, deer, mongoose, tortoise, many very large crocodiles, and tons of exotic birds. We feel incredibly lucky to see some of these animals in the wild before they are gone, as they are quickly losing habitat to development. 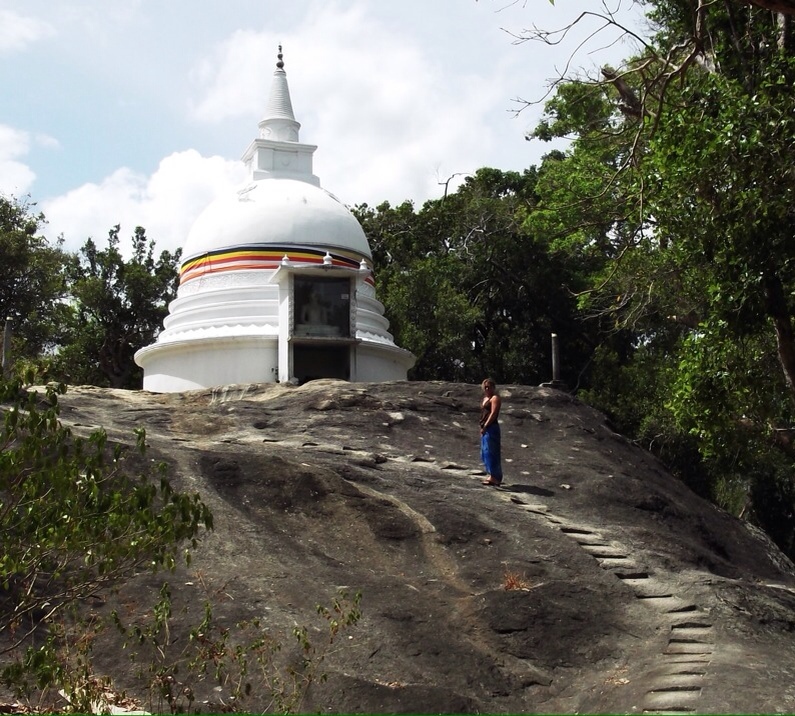 Fortunately Sri Lankans seem to have great pride in their historical, cultural and natural resources and it appears to be a developing country that, despite years of brutal civil war and a devastating tsunami, has it together in many ways. We are quite impressed. While we toil away our days in A Bay, we are planning the next leg of our trip, which makes us really feel like we have big WPP – White People's Problems. What should we do? Where should we go? Ideas? Miles and miles of white sand, blue water. We just can't get enough of seeing these guys in the wild. How cute is that? Everyone enjoys a nice train ride. Look, we got seats on this one! The men and their new toy. And, yes, they let Katy drive it too. Oops, look where Katy is. This was while waiting for a very late bus in a grimy bus station. There. Much better. Post surf reading time. Dagobas (or stupas), mini Buddhist temples, are found everywhere. 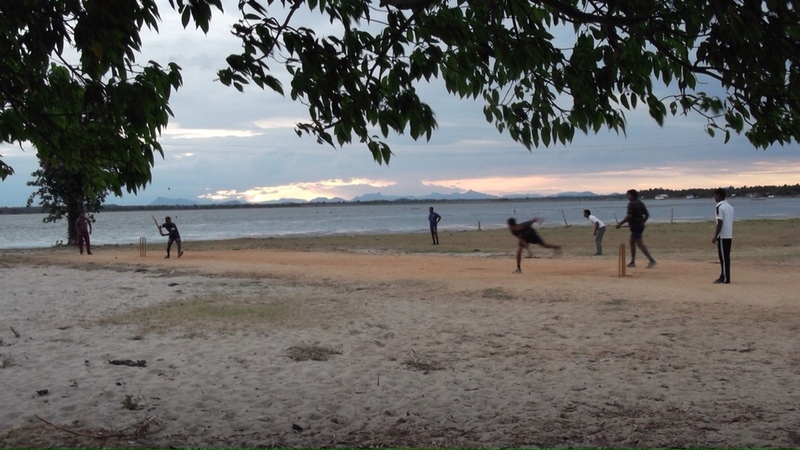 Sunset cricket match. We are starting to learn the rules. Lots of old clunkers like this. Solitude while searching for waves. 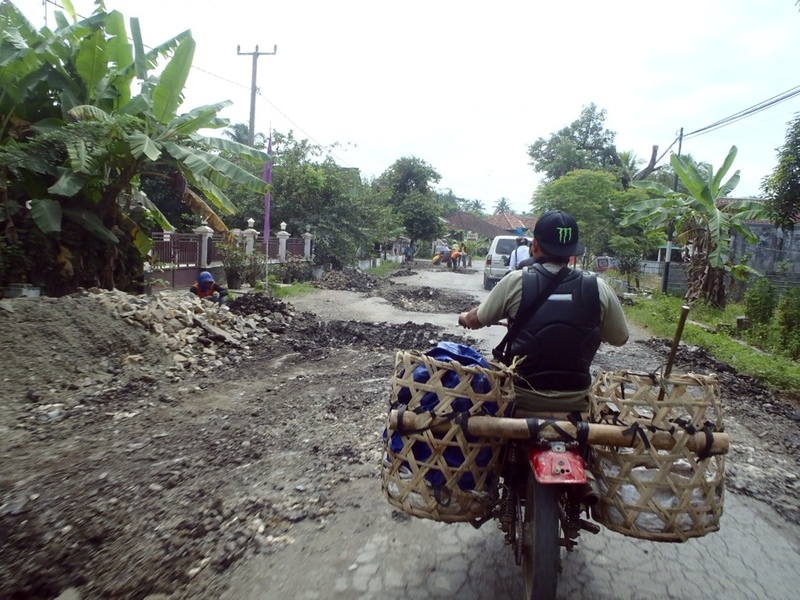 We are in our final days in Indonesia, and the last two weeks or so were spent in a quiet little village at an “end of the road” spot in West Java. It was a real treat that on most days, it was very peaceful with minimal traffic and not many people other than a fantastic bunch of local surfers. However, weekends quickly transformed into mayhem. One thing is for sure; Indonesians are keen on getting out of the city and enjoying some beach time on the weekends and they come in by the busloads. Rolling in the gentle surf getting covered in sand, these people know how to have good, wholesome fun… sans alcohol. Being a Muslim country, there is virtually no alcohol consumption by the locals, save for a few young locals, who might enjoy a Bintang every once in while. We feel like heathens. We enjoyed the surf on the weekdays and embraced the weekend chaos. Last weekend, the surf conditions were not very good, so we took the motorbike out on a surf mission to find good waves. 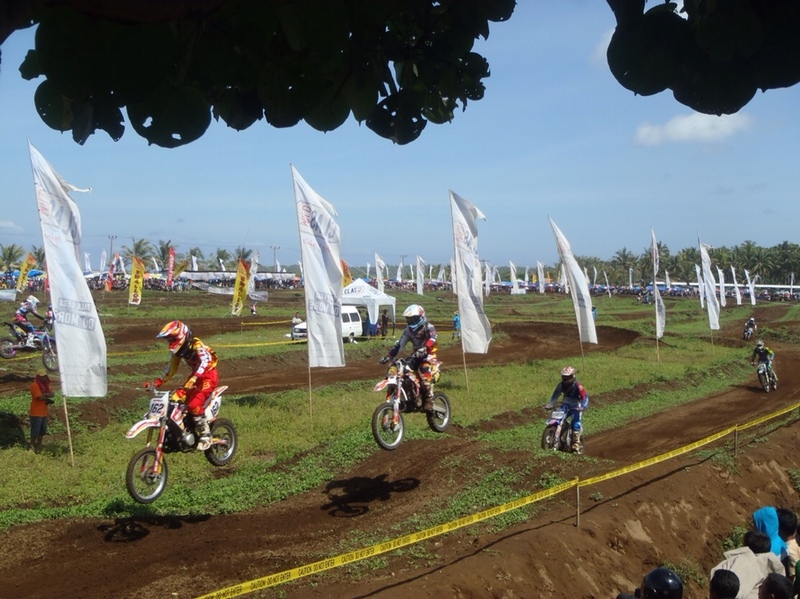 We didn’t find any waves, but we did stumble into the 2012 Indonesian Motocross Championships. Yes, we are the hipster, tree hugging surfers, but we are game for anything, and find that going to sporting events in other countries can result in some fabulous people watching and cultural experiences. From rugby tournaments in Fiji to rodeos in Mexico, we’ve seen some interesting stuff. So we arrive at the Motocross track fairly early, which is, by the way, in the middle of nowhere, over looking a beautiful stretch of coastline, and score a spot up on a rickety platform in a rubber tree. A perfect vantage point for the day. Now in the US, professional sports usually involve a fair amount of revelry, fan antics and of course, some drinking. Not here. Indonesians, being the most quiet, polite, gentle beings, make us we feel like we are the rowdies, cheering for the riders and clapping for the winners. The place is packed, and clearly most of the spectators have come from hours away to be here, but it’s almost dead quiet, calm and orderly. Only when a rider crashes do we hear a “ohhhhh” from the crowd. From what we could tell, we were the only white people among thousands of Indonesians. When we walked through the “pit” area where the racers were set up, they all wanted to talk to us and pose with us for photos. Our last day at the beach had small waves, so we rented inner tubes for $1 each and rolled around in the playful surf with the kids and families. Really good fun, playing with the locals in the surf even though they appear that they are indanger of sinking due to the weight of all of their clothing, including jilbabs on the girls (Muslim head scarf). West meets East with Katy in her bikini, sharing a wave with a girl in a “Burkini”. Awesome! Yesterday as we began our multi-day overland travels to get to the Jakarta International Airport we had a layover at quite unattractive bus station along a typical busy roadway. We loaded our stuff into the bus and walked out to the highway looking for something that might help entertain us for the next two hours. 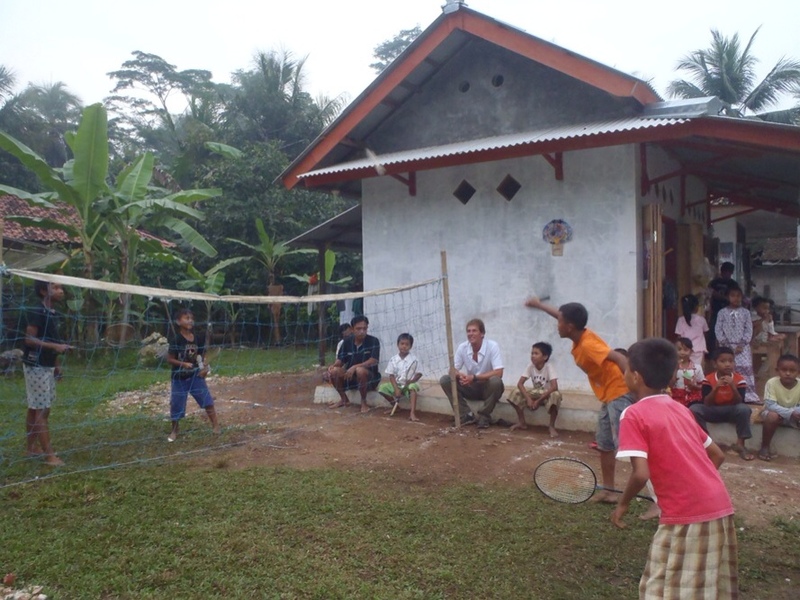 After a short stroll down a motorbike path, we ended up in a little village of sorts with everyone gathered around a friendly neighborhood bout of badminton. Badminton is THE national sport here (the only athletes they send to the Olympics) and we quickly found ourselves in a heated doubles match with the owner of the badminton court and his son. Thankfully for all, they (and we) were laughing too hard to keep score. After making many new friends and working up a good sweat, we had to say goodbye and catch our bus for our next journey. We’ve also perhaps aligned our priorities a bit better for three more months of travel. Actually, its more like we found another surfboard we just HAD to have. 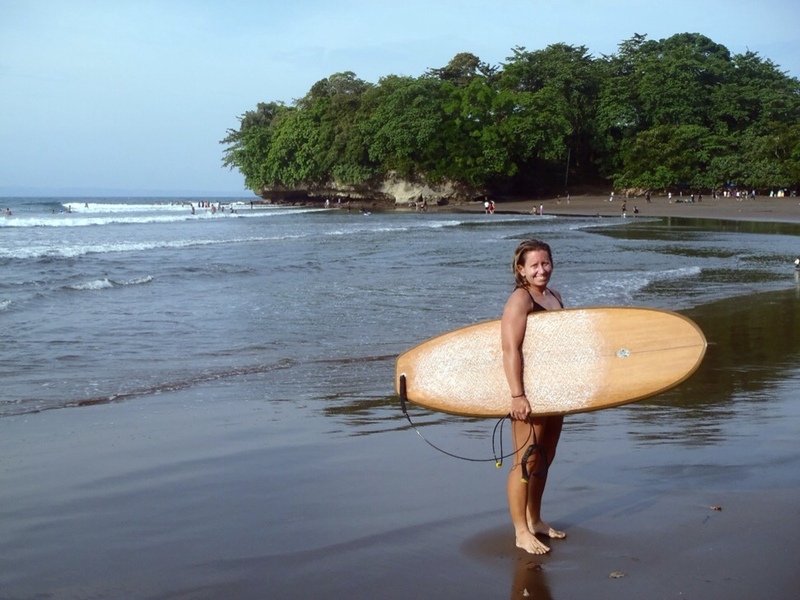 Katy is the proud new owner of an Indo-made 5′ 4″ surfboard that she affectionately calls “The Peanut”. She claims it called her name as she walked by. The board is tiny, suits her perfectly and she is looking forward to her getting a lot of fun waves on it in Sri Lanka. In light of this extra luggage we were able to downsize the rest of our belongings into one travel bag. With only three months left, guess we don’t really need those few extra t-shirts. Indo has been a blast! The people really are nothing short of amazing and are some of the nicest we’ve ever met, thankfully because there sure are a ton of them. The beaches and waves lived up to our expectations and then some. When we do get back to the US, we will never take for granted our bike lanes, our parks and our quiet places, but we will surely miss the Indonesian hospitality, the “hello misters”, and the smiling faces everywhere. 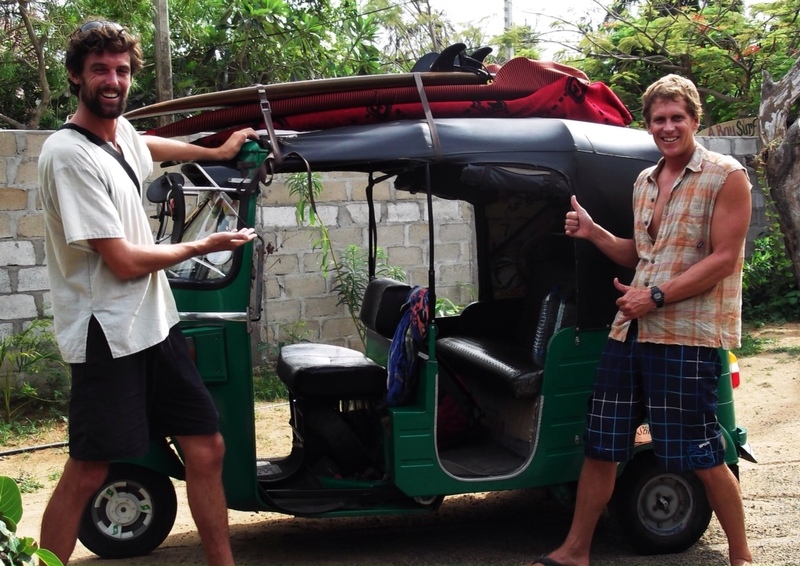 We’re off to Sri Lanka to surf with the elephants! 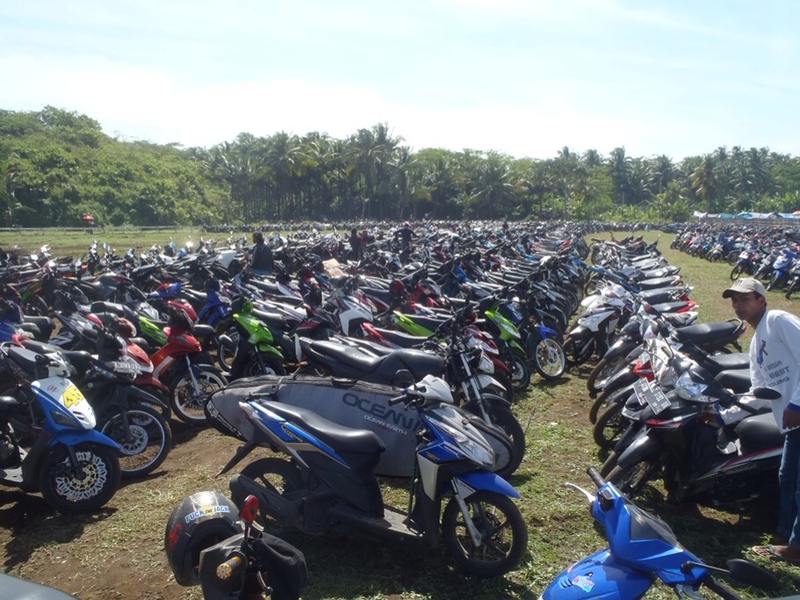 This was about half of the motorbike parking area. Luckily we had surfboards to help find our bike. Katy getting a few first rides on her new board. If you can’t beat ’em, join ’em. Going tubing with the locals. A farewell badminton match. They crushed us.